Today, June 5th, is the anniversary of the Tank Man photo on Tiananmen Square. That got me thinking about life since that fateful day in 1989, the places I've visited and, ultimately, the miracles I take for granted. Four years ago, I wrote about that image (PS, that link points to some really cool stories behind the Tank Man photo) and two summers ago, at about this time (how could I not have put two and two together? ), I had the opportunity to stand just yards from the spot that drew the gaze of the planet back in 1989. As I reflected on the 24 years between Tank Man and today, I'm struck by a single thought: miraculous. 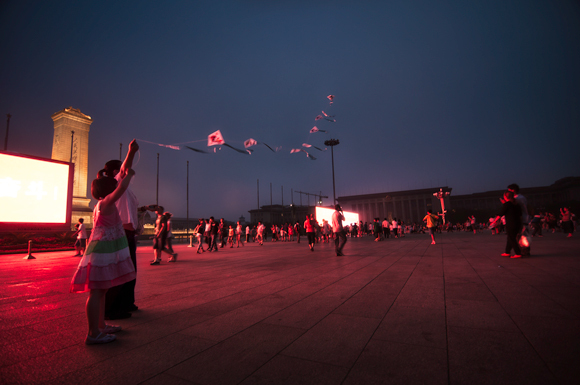 A girl and her mother fly a kite in Tiananmen Square, Beijing, China. July, 2011. Ponder that and be amazed. Then, go, and be courageous, too.